Statistics current as of July 17, 2012. After a dominant amateur career, Carmichael made his pro debut for the (Splitfire Pro Circuit) Kawasaki team in 1997. He was fast but erratic in Supercross; winning several main events. Crashes and inconsistency cost him the title to Suzuki's Tim Ferry. Outdoors, Carmichael was much more in his element, and he beat defending champion Steve Lamson for the win at the first round. Carmichael was very dominant and won the overall title in his rookie year. He more than made amends for his rookie-season loss in Supercross by winning all 8 main events of the 1998 125cc East Region. He won the East/West shootout as well. Outdoors, he defended his title easily despite early challenges from Lamson, John Dowd, and Mike Brown. Carmichael jumped to the 250 class for Supercross in 1999 with the Factory Kawasaki team. It started off reasonably well with some top 5 finishes, but had a violent crash in the early rounds and was forced to take time off. The rest of the year was filled with crashes and disappointing results and Carmichael failed to finish in the top 10 overall. He raced 125 outdoors once again with Pro Circuit, and again dominated that series for his third title in a row. In 2000, Carmichael jumped to the 250 class full-time. He was much more consistent this year with regular top 5 finishes, including his first win at Daytona. He finished 5th overall behind eventual champion Jeremy McGrath; the latter's final title. Outdoors, Carmichael had no such trouble adapting the bigger bike and was the class of the field. He had some close battles with Sebastien Tortelli, but ended up winning the 250 National Championship in his first try. Jeremy McGrath is one of the most popular American Motocross/Supercross champions in the history of the sport, racking up 7 Supercross championships. He was most active in the 1990s earning the title the "King of Supercross." McGrath didn't start riding motocross until the age of 14 because he spent his younger years riding BMX. That experience helped him revolutionize the way supercross was ridden, employing a technique he learned in BMX allowing him to stay a foot or two lower over jumps by coming in with more speed then soaking up the landing into his body similar to the way you ride BMX. One of his BMX "tricks" during jumps on the supercross track, the most famous of which he called the "Nac Nac", helped spawn the sport of freestyle motocross. McGrath won the AMA Pro Athlete of the Year Award in 1996. Still competitive in Motorcycle racing, he has tried his hand in many types of motorcycle competition. Lately he has expanded into off-road trucks in the Pro 2WD division of the LOORS Series and occasionally tries his hand at stock car racing. McGrath lives in Southern California with his wife Kim and daughters Rhowan and Bergen. McGrath has the privilege of being the first rookie ever to win the AMA 250cc Supercross Championship, in 1993. By 2001, Carmichael had showed a new commitment to his fitness and preparation. After some early series battles with McGrath, Carmichael took a chokehold of the points lead and won 13 out of 15 Supercross races as well as the championship. After another battle with Tortelli and Kevin Windham outdoors, Carmichael won that title again as well. Kevin Windham, is an American former professional motocross racer. At 17 he received a full factory ride from Team Yamaha. He has raced for many factory teams and holds several titles, back to back AMA 125 West Supercross Championships in 1996 and 1997, the 2005 Motocross des Nations team championship, and 2nd in points for the 2008 supercross season. In 1999 Windham won the United States Grand Prix of Motocross held at Budd's Creek, Maryland. Despite his longtime status as one of the world's fastest motocross racers, he is yet to win a major National or World Championship. He is better known by the nickname K-Dub on the racing scene. He announced his retirement from racing at the third round of the 2013 Supercross season. Carmichael switched to Honda for 2002. He suffered a horrendous endo at round one of Supercross; earning no points. He mounted a furious comeback by winning 11 races from 16 and the title over David Vuillemin. David Vuillemin is a French professional motocross rider. Carmichael accomplished something that year previously thought impossible. He won all 24 motos of the 2002 National season. In 2003, Carmichael won both Supercross and National titles again; winning 7 races indoors where he faced a stiff challenge from Chad Reed. He won the National title again with a 9 race wins over Windham. Chad Mark Reed AM is an Australian motocross and supercross racer. He is a multi-time supercross and motocross champion and the record holder for most Main Event starts in Supercross history, with 228 starts as of 2018, with his career spanning almost 20 years. He was taught from a young age as being capable of competing at the sports most elite level. He has proven to be the most consistent supercross/motocross racer in the 2000-2009 decade, and has grown to be one of the sports most loved individuals, due to his years of experience and dedication to his sport. He has since ascended the international ranks of the sport to become Australia's most successful motocross racer. In 2004, Carmichael was injured for the Supercross season, he had a knee injury (torn ligaments/meniscus) but came back for the Motocross season to record his second perfect season; winning 24 of the 24 motos he raced and all 12 overalls on his Honda CRF 450; his first effort on a 4-stroke bike. Carmichael entered the 2005 season as the underdog, due to missing the prior season with the knee injury, now as a Suzuki factory rider. In what was projected as "the perfect storm", James "Bubba" Stewart made his debut in the premier 250cc class, along with perennial contenders Chad Reed and Kevin Windham, Carmichael triumphantly regained his Supercross title, with seven victories to Reed's five, Stewart's three, and Windham's one. Later that summer, Carmichael won all 12 events in the 250cc Outdoor National Championship again; winning 22 of 24 motos on an RMZ450. Carmichael also scored the US Open of Supercross title and led Team USA to a convincing victory at the Motocross des Nations. James Stewart Jr., also known as Bubba Stewart, is an American professional motocross racer who competed in supercross riding the No. 7. Through his years of racing, he earned the nickname “The Fastest Man on The Planet”, due to his extraordinary talent, speed, athleticism and innovation. James is also known for innovating the "bubba scrub" or just "scrub", which revolutionized the sport and became a fundamental skill needed to compete in Professional Motocross. In 2008 he won every race and every moto of the AMA Motocross season. The only other person to do this is Ricky Carmichael. James is #2 in all time 450 Supercross wins(50), and #2 all time in Pro AMA wins(98). He was the first to bring major outside sponsorship to the sport (Nike), and the first to host his own television show "Bubba's World" which brought even more attention to the sport. He is arguably the most financially lucrative racer, bringing in endorsement deals paying him over $10M a year throughout his career. Known for his vibrant personality and big smile, James has been featured in news outlets like Rolling Stone, The New York Times, Maxim, ESPN The Magazine, GQ and many more. Additionally, Teen People named him one of “20 Teens Who Will Change the World”. He has the record for best rookie season, having won 10/12 Motocross races in 2002. James has 5 FIM World Champion titles from Motocross of Nations, and World Supercross. 4 AMA Supercross Champion titles, and 3 AMA Motocross Champion titles. He won the Redbull Straight Rhythm in both 2014 and 2015. He's a Motocross legend who battled the greats of multiple era's. The Motocross des Nations is an annual team motocross race, where riders representing their country meet at what is billed as the "Olympics of Motocross". The event has been staged since 1947, where the team of Bill Nicholson, Fred Rist and Bob Ray, representing Great Britain, took home the Chamberlain Trophy for the first time. Carmichael campaigned the 2006 Supercross season aboard an RMZ450; his first attempt at indoor competition on a four-stroke. It was the most exciting series battle in recent memory. There were multiple points lead changes and race winners, and Carmichael, Reed, and Stewart all entered the Las Vegas finale within 5 points of each other. With Carmichael and Reed tied for the lead, and Stewart only 1 point behind them, it was a close race. Carmichael rode to a safe second-place finish behind Stewart and ended the series with 6 victories and his fifth Supercross championship. He indicated that 2006 would be his last full-time season and planned to retire the following year. In the 2006 Outdoor National Championship season, Carmichael once again dominated all comers, including James Stewart, in winning 9 races and placing second twice. However, at the season finale at Glen Helen Raceway, Carmichael suffered a terrible crash while challenging James Stewart for the win and was unable to finish the race. Carmichael had already clinched the overall championship at the prior round. In the crash, he sustained a shoulder injury and was unable to compete in the Motocross of Nations race in England. Ivan Tedesco replaced him on Team USA and helped lead the American team to victory. As planned, Carmichael raced only a partial schedule in 2007. He would only race select events for Team Makita Suzuki while pursuing his new stock car career. Carmichael finished with two Supercross wins and six Outdoor National Championship wins, winning every race he entered. Carmichael capped his career with a winning performance at the X-Games and a victory with Team USA at the Motocross of Nations in Budds Creek, Maryland. In 2007, Carmichael signed a driver development contract with Ginn Racing, which would later be merged with Dale Earnhardt, Inc. Under the tutelage of veteran Mark Martin, Carmichael started his transition to stock cars by racing late models throughout the country. With backing from Monster Energy, Carmichael later transitioned to Ken Schrader Racing, and ran a few races in the Camping World East Series, including the prestigious Toyota All-Star Showdown at Toyota Speedway in Irwindale, California. In 2009, Carmichael was tabbed by Sprint Cup Series driver Kevin Harvick to drive the No. 4 Chevrolet Silverado in 18 races for Harvick's team, Kevin Harvick, Inc. Though the transition wasn't easy, Carmichael finished 22nd in Truck Series points that year. In 2010, Carmichael and Monster left KHI and went to Turner Motorsports, where he would gain 9 top tens en route to finishing 13th in the points. Carmichael also made his Nationwide Series debut at Kansas Speedway, starting 12th and finishing 18th. Carmichael returned to Turner for 2011, and split the No. 30 Chevrolet in the Nationwide Series with teammates James Buescher, Reed Sorenson, Jason Leffler and Mark Martin. On September 2, 2011, Carmichael achieved his first career pole at Atlanta Motor Speedway in the Camping World Truck Series. In 2009, for the BBC show Top Gear , Ken Block took James May out for Gymkhana-style driving at Block's stunt course at Inyokern Airport; an operational California airport. Carmichael appeared in a supporting role, to which Block described Carmichael as 'a good friend'. He was voted 2009 Camping World Truck Series Most Popular Driver. Donny Schmit was an American professional motocross racer. He was a two-time Motocross World Champion, winning the 125cc title in 1990 and the 250cc championship in 1992. John Dowd, also known as "The Junk yard Dog", is an American former professional motocross racer from Chicopee, Massachusetts. Dowd entered his first motocross (MX) race at age 20, considered old for prospective professional motocross riders. Dowd progressed quickly in the sport and was soon beating riders with many years more experience of motocross than himself and was able to turn professional by age 21. Jeffrey "Jeff" Ward is a British-American former professional motocross racer, auto racing driver and off-road racer. He won the AMA Motocross Championship five times and the AMA Supercross Championship twice and the Motocross des Nations seven times. After retiring from motorcycle competition, Ward turned to auto racing, finishing in second place at the Indianapolis 500 and winning a race at the Texas Motor Speedway. He then competed in off-road truck racing and is currently competing in rallycross racing. Ward was inducted into the Motorcycle Hall of Fame in 1999 and, was inducted into the Motorsports Hall of Fame of America on 12 August 2006. Cam Jeffrey Emig is an American former professional motocross racer. He was one of the top American motocross racers of the 1990s. During his motorcycle racing career, Emig won four AMA Motocross Championships, an FIM World Supercross title and was a six-time member of the U.S. Motocross des Nations team. He was inducted to the AMA Motorcycle Hall of Fame in 2004. Sébastien Tortelli is a two-time World Champion motocross racer. A longtime factory-sponsored rider, Tortelli has been a top ranked rider in both AMA National and Supercross competition, as well as the European-based Motocross Grand Prix World Championships. Ernesto Fonseca, also known as "El Lobito" and "The Fonz", is a retired professional motocross and supercross racer from Costa Rica. Robert Gregory Hannah is an American former professional motocross racer. He was one of the most successful motocross racers in AMA history, with 70 AMA national championship race victories and 7 motocross national championships. Greg Albertyn is a South African former World Champion motocross racer. He is now a real estate developer in Riverside, California, United States. Doug Henry is an American former professional motocross racer. He is a three-time AMA motocross national champion. Ryan Villopoto is a former American professional motorcycle racer who competed in the AMA Supercross and Outdoor Motocross and MXGP championships. Villopoto competed in the AMA Supercross series and the AMA Lucas Oil Motocross series. Tim Ferry II is an American former professional motocross racer. Ferry began his amateur career with the Kawasaki factory racing team throughout the 80's and early 90's. He turned pro in 1992 and won the 125 East Coast Championship in 1997 riding for Suzuki. He moved up to the 250cc class the following year and started riding for Yamaha. In 2001 he started riding on a 426cc four-stroke. He won his first 250 cc Motocross race that same year. Ferry currently is retired from professional racing. James "Jamie" Dobb is an English former professional motocross racer. Amongst his achievements, he was crowned 125cc Motocross World Champion in 2001, and was a top rider in the AMA motocross and supercross series during the mid-1990s. Ryan Dungey is a former professional motorcycle racer who raced in the AMA Supercross and Outdoor Motocross championships. A four-time supercross and three-time motocross champion, he retired after the 2017 supercross season. Ivan Lee Tedesco is a retired American professional motocross and supercross racer. Tedesco was the 2005 AMA 125cc Motocross National Champion. He is nicknamed "Hot Sauce", and he races on a number 9 bike. ↑ "Mark Martin, Ricky Carmichael among 2015 inductees into Motorsports Hall of Fame of America". Fox News . Retrieved January 24, 2015. 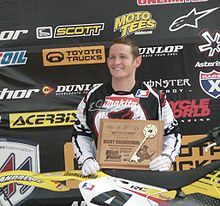 Wikimedia Commons has media related to Ricky Carmichael .